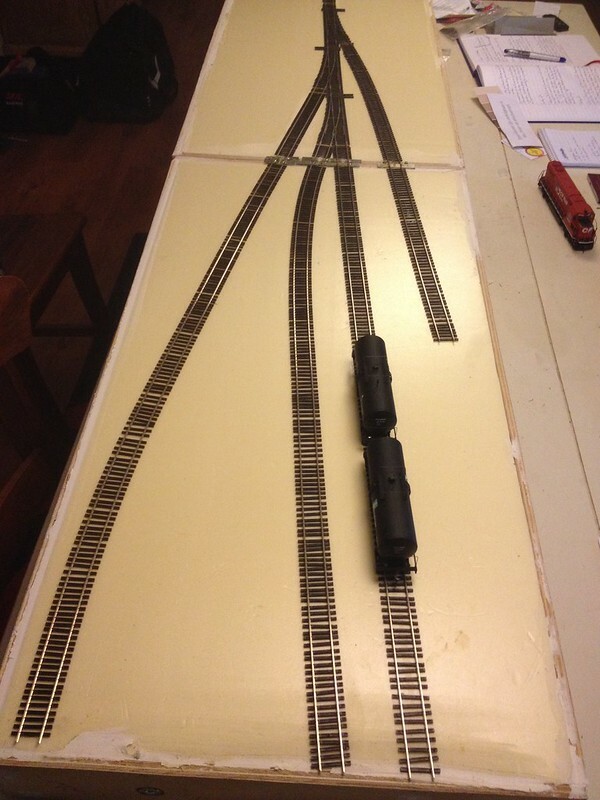 A couple weeks later sees the completion of the initial track work. 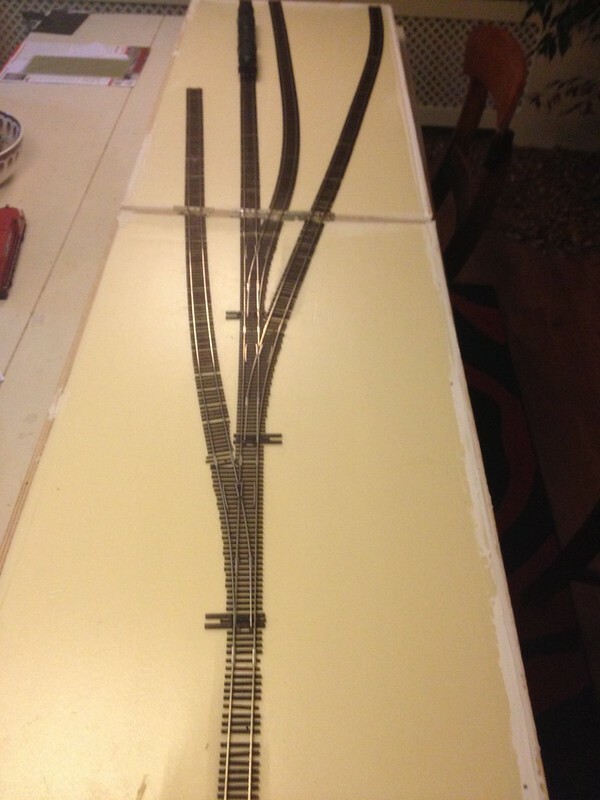 PCB board has been used on the transition from one board to the next for added strength, several ties removed for a more 'run down' look, and all plastic between ties underneath the rail cut away prior to installing the flex rail (all PECO code 83) to create more 'air' below the rail for a more realistic appearance. Next is to install the dropper wires for the track power feeds. Don't expect me to progress fast though. I'm limited in modeling time, and funds for this one, so I'm taking it one step at a time. 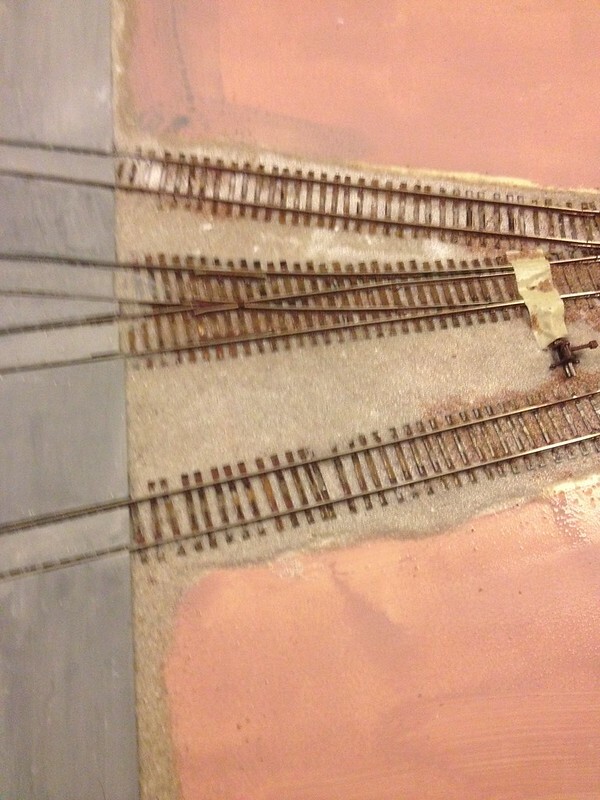 The light colour ballast is a grey aquarium sand, and the brown is some left over 'Bush' Z scale ballast, which I deliberately used and blended in more and more towards the end of the module, so it would match the colour on my Wolter Springs module. 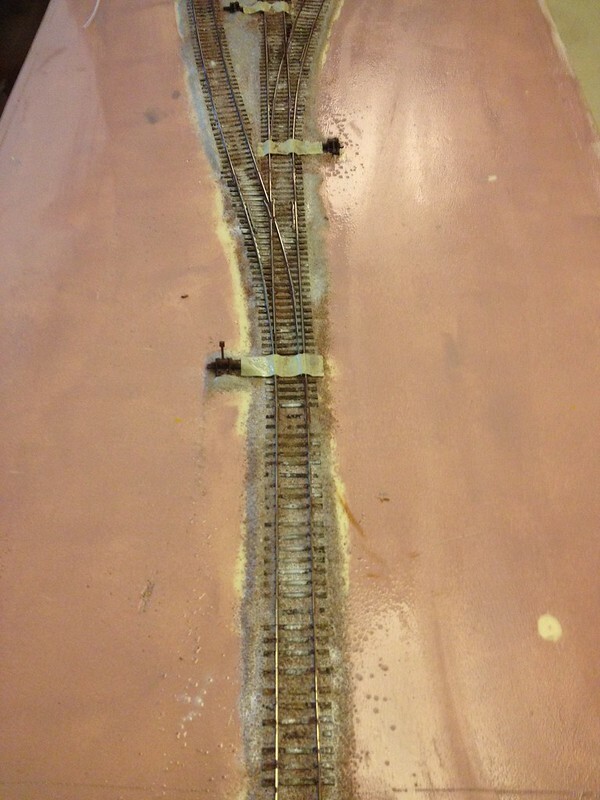 Now that the ballasting is done, I've turned my attention to structures. I have started on the corn syrup industry, for which I used parts of a Pikestuff kit. (the 2 stall engine house). The space on the module is a bit too tight to use the full width and length of the building, so I reduced the width by about 1", and the length by half. 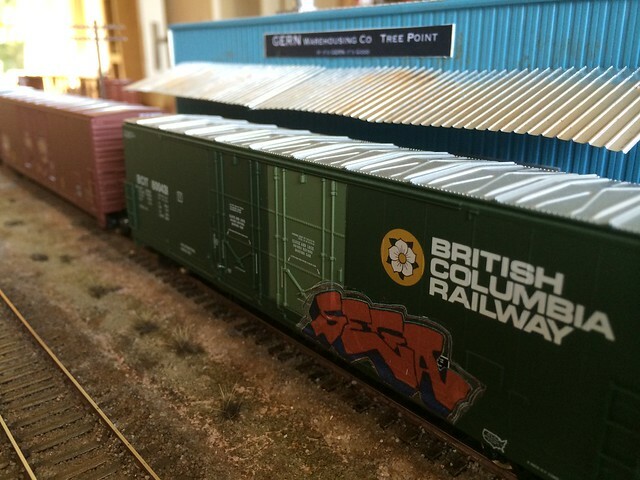 As Pikestuff is very recognisable with their blue and white colours, I painted mine using artist acrylics. A couple of fades on the walls to start with, and a solid grey colour on the roof. A lot more still needs doing, but the basic idea is here. 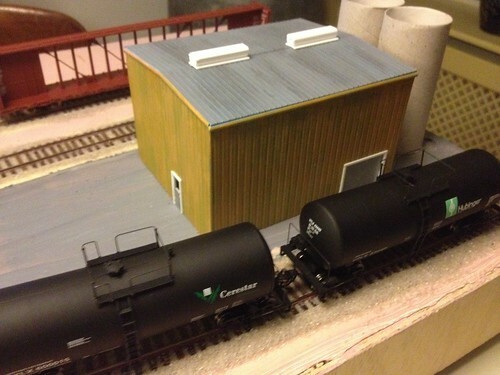 Next to the building I'll be modeling some syrup silos etc, and of course piping etc for the unloading facility. The view below is from the rear, with the unloading spur in the background. 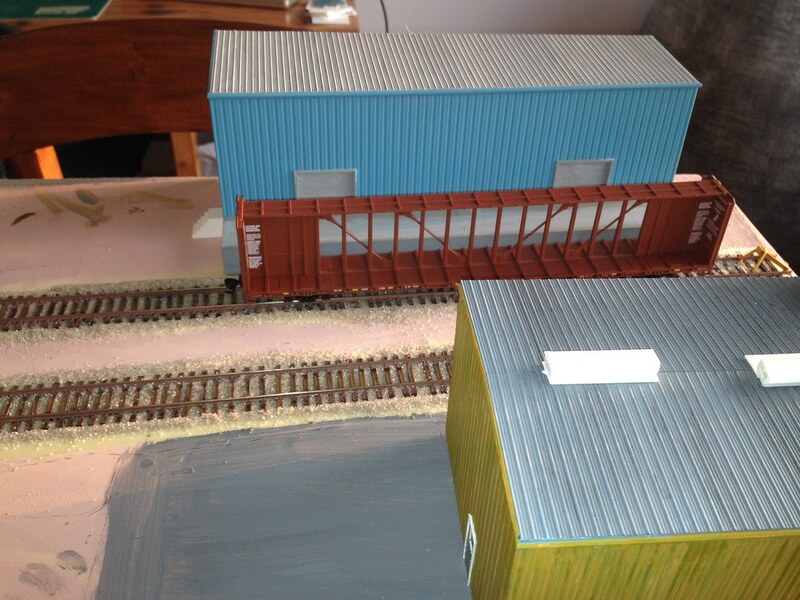 The toilet rolls are there to give me an idea how the silos (that I still need to build) are going to fit in the scene. I've started on a second small industry, just a general warehouse. This one has been build to fit the space using Pikestuff parts mostly. The walls of the building have been painted with dilluted Artist acrylics, just like the previous building. I managed to mix up a blue colour that is a close match for the pikestuff materials, but painting it as such get's rid of the plastic shine, and gives a good base for further dirt and grime weathering. 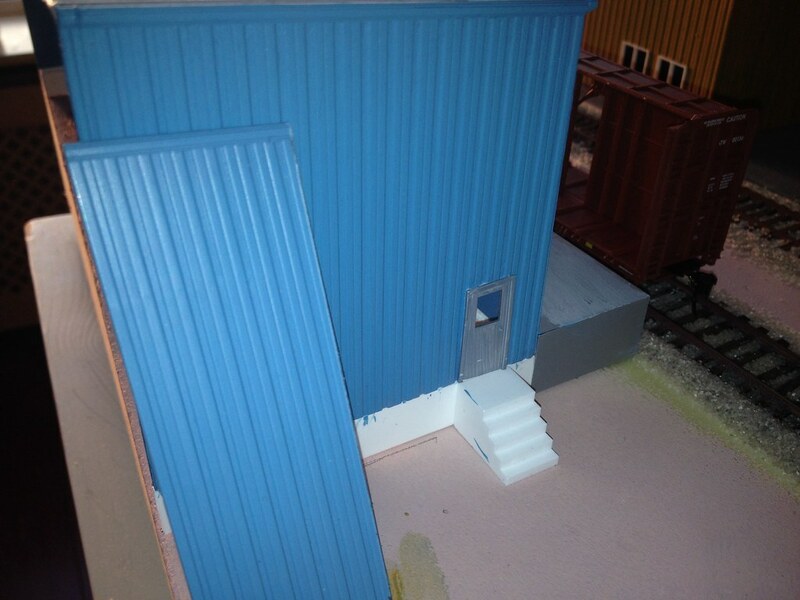 There's still a lot to do, I want to put a 'roof' over the loading dock, and lots of smaller details such as downspouts, roof vents etc still to be added too. I did like a blue building, as I've seen many pictures of generic warehouses in the US build like that. Here's a picture of the side of the building, the loose pic is a piece of stock Pikestuff wall, the building behind it is painted, as said, a very close match. And here it is from the track side. 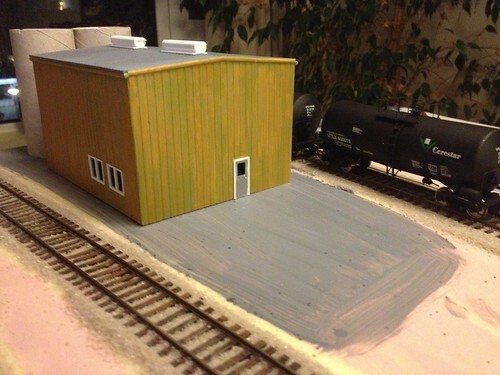 Moving on a bit, I've started on adding some Scenic Express 'mud' , and I weathered the ballast. I didn't like the appearance of the aquarium sand, even though I did like it's granule size, it was just too bright and of one colour. I've used some artist acrylics and a round brush, dabbed this in the paint, then dabbed it on a sheet of paper to remove most of the paint, and proceeded to dab the remaining paint on the ballast and ties etc. 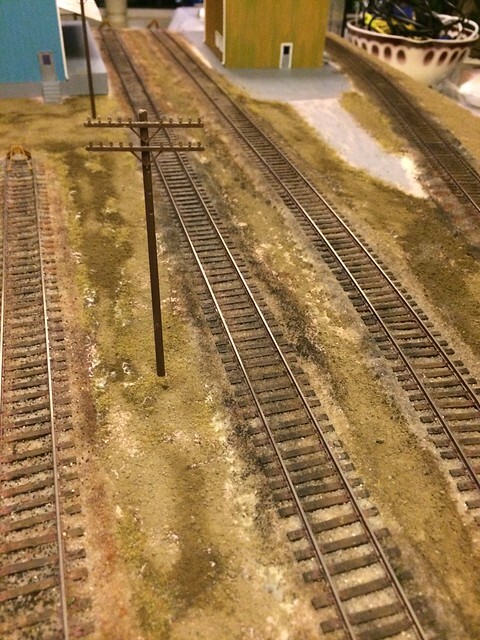 A couple of different colours were used in random fashion, and it is already a lot better than before, but more will follow once this initial application has dried. 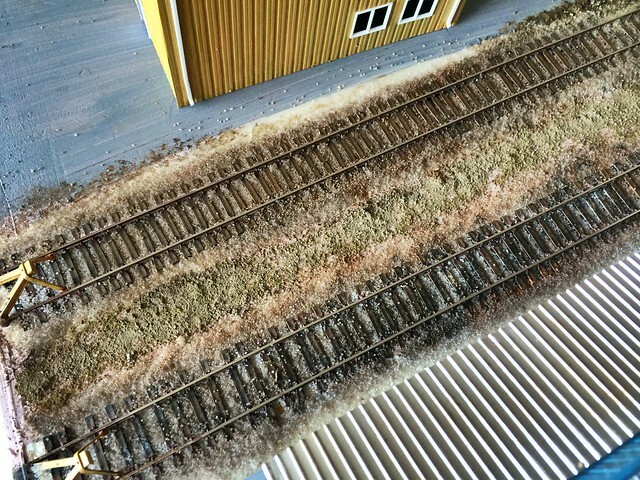 A wash may be better, I've tried that with the sieved sharp sand I use for ballast, and it worked well. Although the sand does have a more varied colour to start with. 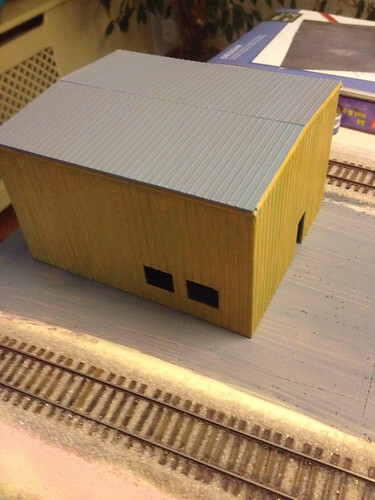 I weathered my blue building with water soluble oil paints. I brushed on diluted white and wiped most off and then the same with brown. If too much is put on, you have some time to wipe it off with a damp cloth. Thanks Mike, I'll consider that option. My buildings are also painted with artist paints, again Acrylics, but also diluted with water, giving them a more irregular cover, particularly on the brown building this has been quite effective. Here's the same board from a different perspective, still plenty to do and touch up too. I also use acrylics, mostly pens for weathering, but they do dry very quickly, to the extent that I hold the pen and a brush at the same time so I can spread the paint as soon as possible. Their big advantage is no mess so I can weather trucks etc. sitting on the sofa. 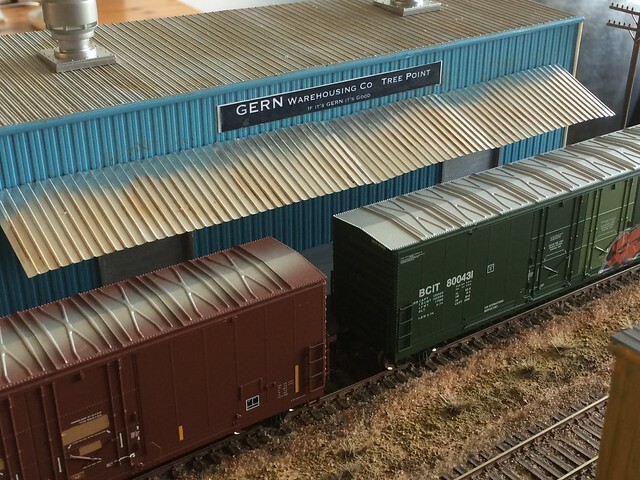 The GERN Industries corporation has just announced the opening of a new facility in Tree Point, Wisconsin. Rather than building a new warehouse, they took over existing facilities, saving them sufficient money to be at least 3% better off. 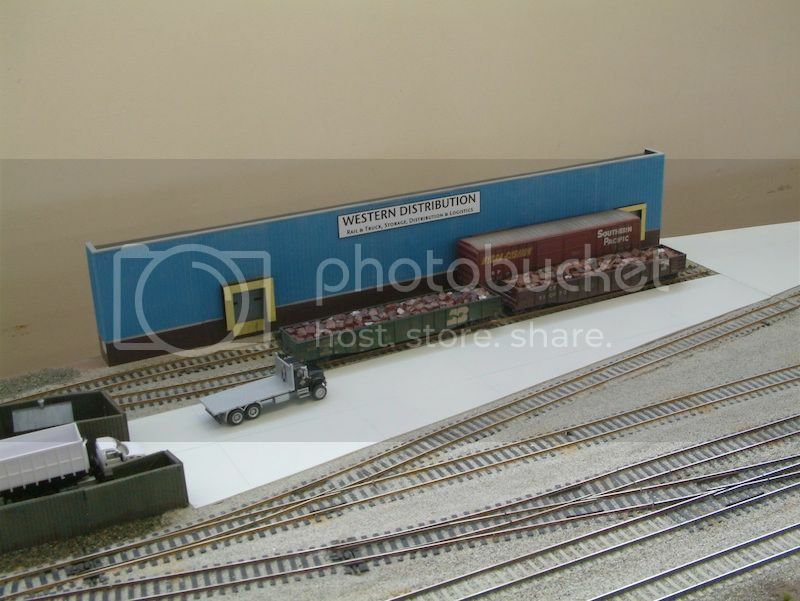 The facility will enable the company to distribute their products in the area by rail, rather than road, due to rising demand, and complaints from the local town council, due the traffic created by the trucks which increased such that is causes gridlock at busier times in the day. 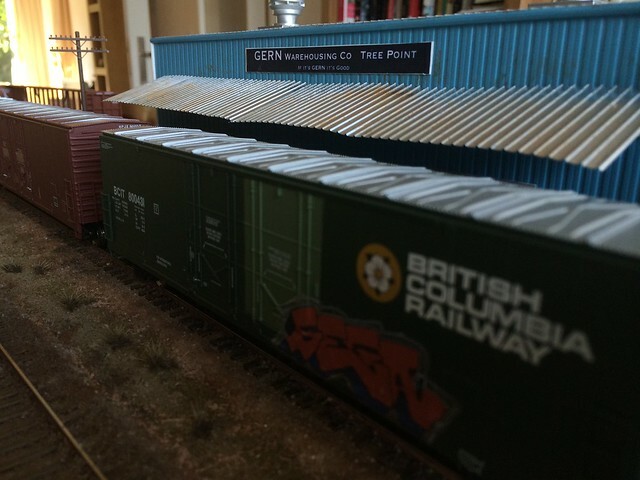 Immediately after the opening, the first box cars arrived, and caused an immediate reduction in road traffic of 3% in the first hour of the facility being opened, this could have been better had it not been for the press showing up, and the protest some local truckers staged.